Ignalum was located in Markham, Ontario, Canada. The privately held company was founded in the year 2002 with a vision of creating a cost-effective, installation-friendly, complete Linux-based operating environment offering full Windows compatibility. Ignalum Linux was a complete, Red Hat and RPM-based operating system optimized for the i686-class processors. It contains an easy to use installation program, extensive online documentation, and a menu-driven package system. A full installation gives you the X Window System, C/C++ development environments, Perl, networking utilities, a mail server, a news server, a web server, an ftp server, the GNU Image Manipulation Program, OpenOffice Suite, Netscape Communicator, plus many more programs. Ignalum Linux can run on any P6-class and higher processors (but uses -march=i686 -O2 optimization for best performance on i686-class machines like the P3, P4, and Duron/Athlon). Rate this project Raffaele Forte has announced the release of BackBox Linux 2.05, an updated version of the project's Ubuntu-based distribution designed to perform penetration tests and security assessments: "The BackBox team is proud to announce the release 2.05 of BackBox Linux. The new release includes features such as Ubuntu 11.04, Linux kernel 2.6.38 and Xfce 4.8.0. What's new: system upgrade; bug corrections; performance boost; improved start menu; improved WiFi driver (compat-wireless aircrack patched); new hacking tools - Creepy, fern-wifi-cracker, Joomscan, Pyrit, Reaver, Xplico; updated tools - Crunch, Fimap, Hydra, MagicTree, Metasploit... System requirements: 32-bit or 64-bit processor; 256 MB of system memory (RAM); 4.4 GB of disk space for installation; graphics card capable of 800x600 resolution; DVD-ROM drive or USB port." Here is the brief release announcement. 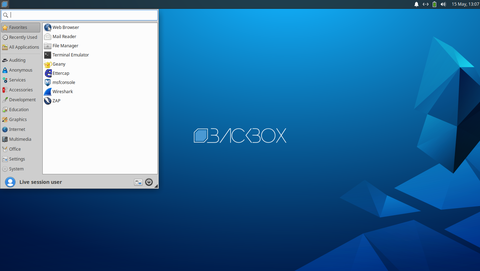 Download links: backbox-2.05-i386.iso (986MB, MD5, torrent), backbox-2.05-amd64.iso (998MB, MD5, torrent).